For years, the picturesque false-front building at the corner of Main and Market was deteriorating. The yellow tanker truck parked next to the building, framed by rusty tin and weathered wood, was a favorite subject for photographers. Now, thanks to Jim Hunolt, who purchased the property a few years ago, the building has been stabilized and transformed into a community space. Kevin Southall did the reconstruction work, aided by enthusiastic volunteers. A new sign above the door announces the building’s resurrection as Darwin Station, in recognition of its history as a gas station. Now Darwin Station provides a versatile space for meetings, meals, music, and celebrations. There’s a fully functioning kitchen, equipped with donated appliances; a piano, and a library. Art works are displayed in the main room. The building is not open to the public. It’s a special place for Darwin residents and invited guests. Visitors are reminded that all buildings in Darwin are private property, and should not be entered even if they appear abandoned. 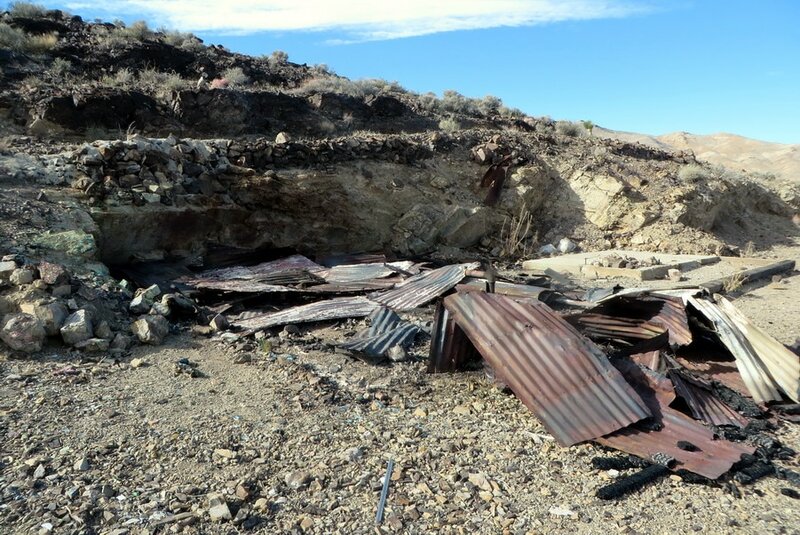 One of Darwin’s historic treasures, the cabin at the Jackass Mine, burned down in the late fall of 2015. There were no witnesses among Darwin residents. No one seems to know when or how it happened. Situated on a ledge carved out of a steep mountainside, the Jackass Cabin was a colorful part of Darwin’s mining history. Deprived of the meticulous care it enjoyed in the past, the cabin was falling apart for years, but the main room still stood and provided shelter and temporary living accommodations for a few lucky visitors to Darwin and adventurous residents seeking to camp out and watch the stars from this magical vantage point. The cabin overlooked the entire Panamint Valley, with a distant view of the Panamint Dunes. If you know where to look, you can make out Highway 190 winding its way up the pass from Panamint Springs. The laughter and music of decades of party-goers still echoes through the adjoining canyons. 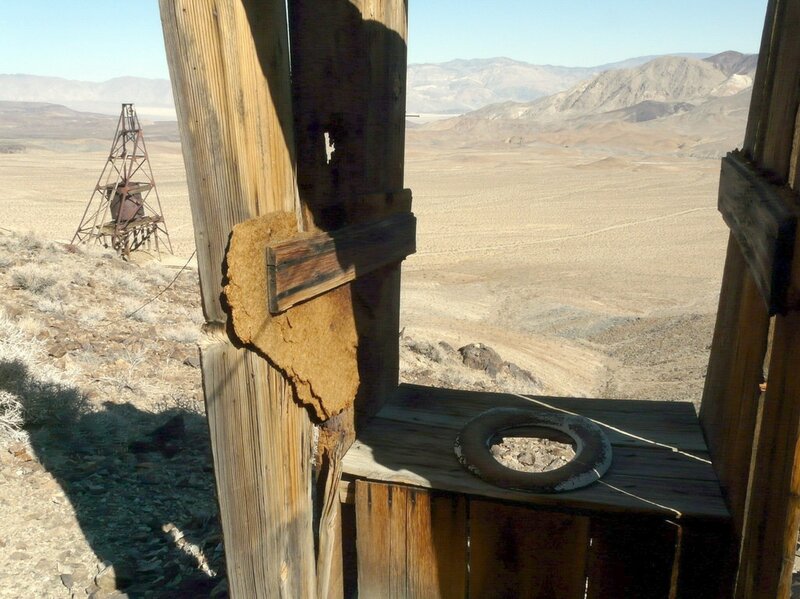 The head frame for the Jackass Mine still stood after the fire, as did the sketchy outhouse, perched precariously at the edge of the cliff. 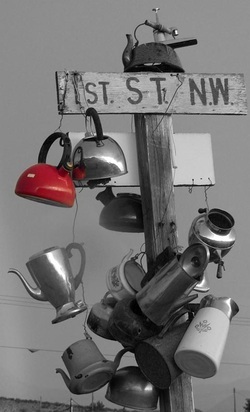 More recently, the outhouse was knocked over, depriving photographers of another favorite subject. We will still be hiking up to the Jackass to enjoy the view and the spring wildflower display, but what a bittersweet experience it will be to see the cabin’s charred remains. FIRST 100 DEGREE HIGH TEMPERATURE AT DEATH VALLEY THIS YEAR! DARWIN IN THE LOS ANGELES TIMES! Here's hoping that the coverage will help to attract the support and help we need to make our broadband dream a reality. For a painfully humorous rundown on our long quest for broadband, check out the website at darwincalif.com. It was through that website that the journalists at the LA Times made contact with us in Darwin. Good work, darwincalif! BLM ROAD PLAN TO BE REVISED--YOUR INPUT IS NEEDED! Maybe you've noticed all the new route markers on the dirt roads around Darwin. These markers were placed by the Bureau of Land Management (BLM) on roads that are designated as legal for off-highway vehicular travel. Any road that is not marked as an OHV route is technically CLOSED to vehicular travel. 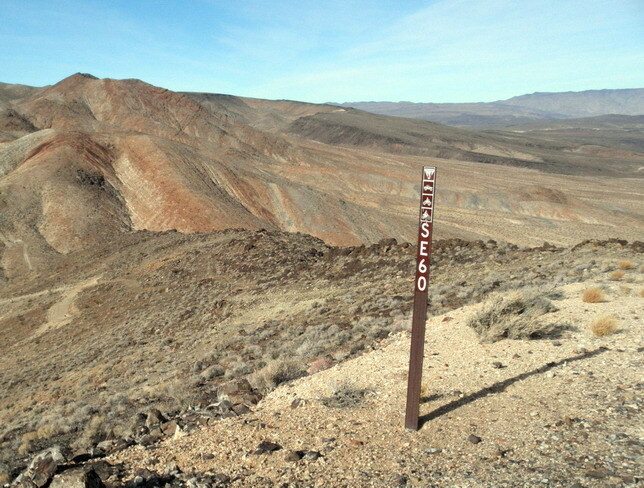 The current route markers reflect the route designations under the West Mojave (WEMO) Plan. However, this is all now subject to change. A judge in the Ninth District Court has ordered that the entire travel management plan for WEMO be scrapped and that BLM start all over, with better documentation of how the designated routes will impact threatened and endangered species. We have had a series of meetings in Darwin to try to make sense of this confused situation. The bottom line is that everyone who is concerned about keeping our roads open should submit comments to BLM by the DEADLINE of APRIL 15, 2012. These "scoping comments" will be considered in putting together a draft of the proposed revised road plan, which will then be subject to further public comment. Click on "Darwin Subregion" on the map and you will be able to download a pdf file of the Darwin map. You can view other maps by clicking on the appropriate subregion. This BLM page contains instructions for submitting comments, either by email, or by downloading and mailing in a comment form. For further information on the court ruling, and another source of the BLM maps, go to the NPL News page and click on the West Mojave links under "Hot Topics" on the right side of the page. Darwin residents will be collaborating on preparing a master map showing all roads we want kept open, including roads that are not currently marked as open. This map, with annotations, will provide a complete road inventory that can be referenced in our individual comments. For further information, contact Kathy Goss. Jim Kenney of Ridgecrest has marked the roads he's explored on jeep rides in the Darwin area. Here's his map, to get you inspired to start identifying your own favorite roads. UPDATE: The package of comments from Darwin residents was sent to BLM in Moreno Valley on April 11, with backup copies sent by email. Please check back for further developments in this ongoing process. Thanks to everyone who participated! Darwin is featured in a 4-minute video on BBC on line, by reporter Franz Strasser. Franz did a fine job of showing the frustrations of dialup (and even satellite service) in our remote location. We have a proposed solution, which could be put in place once the Digital 395 fiberoptic project is completed. Hopefully, this media exposure will help us to locate technical experts and others who might be able to assist us in our quest for true broadband speeds. View the video at http://www.bbc.co.uk/news/world-us-canada-17569954. Unfortunately, we can't watch it very easily in Darwin.